Here's a first day cover with the WOW factor. The photo comes from Sir Roger Moore's personal collection. 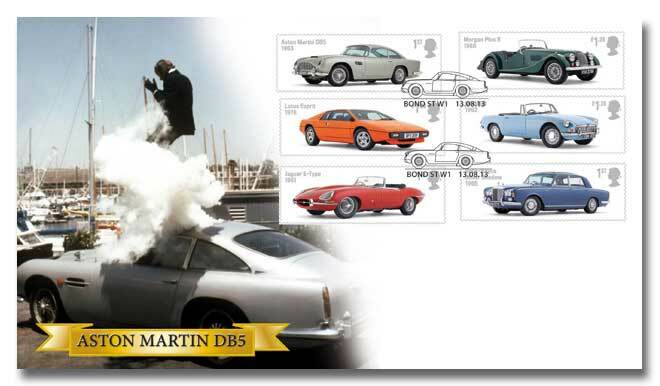 It's of Sir Roger escaping from his Aston Martin DB5 - which is also featured on one of the stamps. 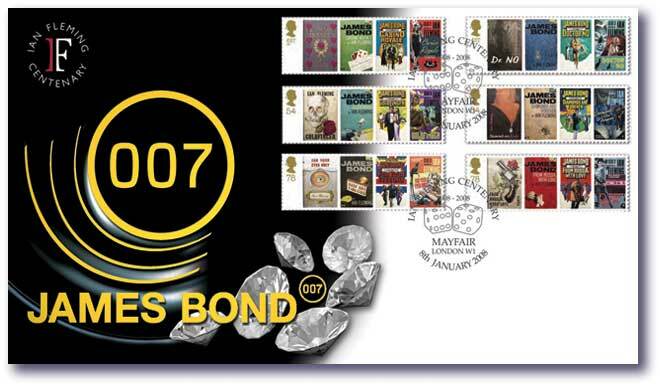 It bears a full set of NEW Royal Mail “British Auto Legends” stamps, postmarked at Bond Street on the issue date. And to top it off, a limited number were personally signed by Sir Roger Moore to raise funds for UNICEF. The covers themselves – whether signed or unsigned - are a limited edition full stop. Once the postmark date has gone, no more can be made. This gives them great investment potential, especially when created by Buckingham Covers. Unsigned editions are £13.95 or £59.95 hand signed by Sir Roger himself. P&P is £1.95. Diamonds are forever . . . and so is this classic James Bond cover. The design, stylish simple to compliment the colourful stamps, shows luscious diamonds cascading before the faintest hint of a gun barrel. 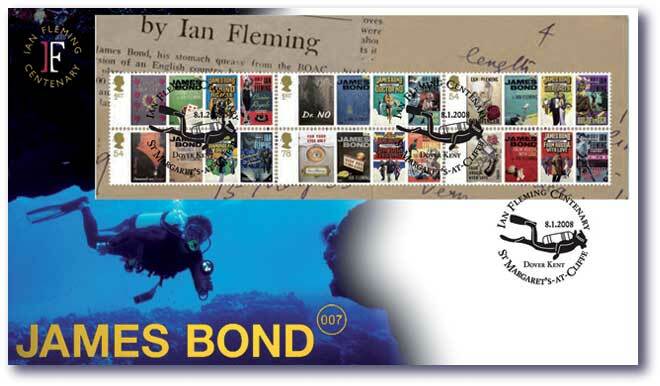 The cover is postmarked at Mayfair, when James Bond's creator, Ian Fleming, was born - and you will see dice in the postmark, in keeping with the 2006 Bond film, Casino Royale. 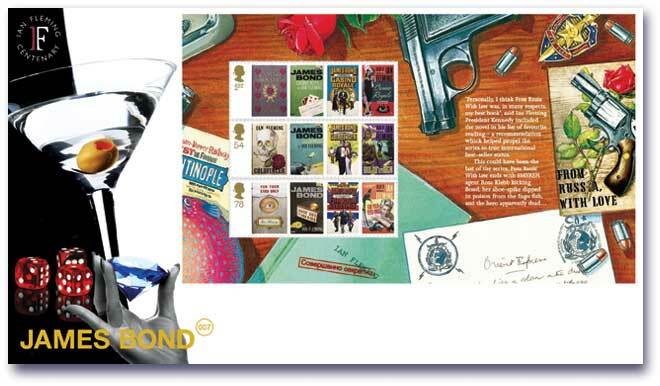 All our James Bond covers are officially licensed by Fleming Productions. NEW SIGNATURES NOW AVAILABLE, LIMITED NUMBERS ON SELECTED LINES. This action packed, underwater adventure cover is officially licensed by Fleming Publications. It is postmarked at St Margaret's-at-Cliff, Kent, where James Bond's creator, Ian Fleming lived. He wrote many of the James Bond books here. Jaws (aka Richard Kiel) has signed a limited number of this cover. Jaws was publicly voted the best James Bond Baddie character recently. A very limited number are also be available personally signed by James Bond himself, Sir Roger Moore. As it stands, these are virtually pre-sold to members of our Platinum Club but there are a few available for non-club members. Be quick! James Bond prestige booklet released January 2008. Sets signed by Bond girls (a different Bond girl to sign each of the 4 covers). 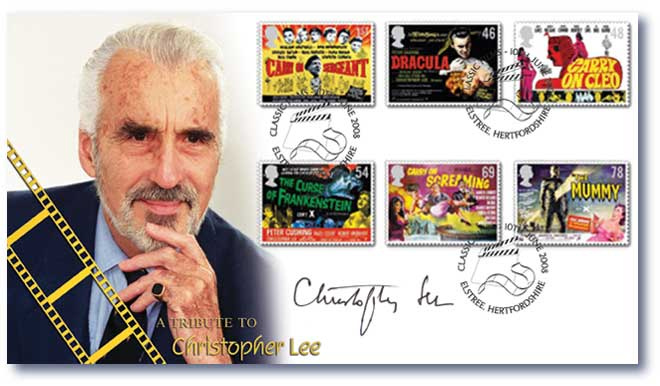 Buckingham Covers also mark Royal Mail's fabulous set of British Film stamps with a tribute to a film icon: Christopher Lee CBE. One of the biggest names of British cinema, Lee shot to fame through the Hammer Horror films - but they are his least favourite in his repertoire! That is why he asked that his tribute cover did not show him as Dracula. Lee specialises in villains and made a superb Saruman the White in Peter Jackson's Lord of the Rings trilogy and is fondly remembered for his performance as Scaramanga - 'The man with the golden gun' in the 1974 James Bond film starring Roger Moore as 007.